If you’re a knitter who knits sweaters or shawls, or other items intended to fit either a large portion of your body, or to be worn over a portion of your body in a very fitted manner (sweaters apply here, also knee socks or long gloves), this means you’ve encountered the directive to pay attention to gauge. Usually this means that before you start knitting the pattern, you’ll need to make a gauge swatch. Or a tension square, depending on your lingo. Now, this is knitting world. In knitting world, no one really has to anything. If you truly have to do something, chances are you don’t really need to ask yourself about whether you need to do it – you’ll just go ahead and do it. So it is with swatching. You might know exactly what gauge you will get with a particular combination of needles and yarn, and you can skip swatching. (So it is with me and Cascade 220 – I know that 4.5mm needles + Cascade 220 = 18 sts/4 ins, quite reliably. I’ve swatched enough times to confirm that in the past, and I feel comfortable skipping the swatch, with that knowledge in mind). On the other hand, (and more likely) you might not be entirely sure of your gauge, and in this case your swatch will do much to inform the success of your project. The truth is, you could skip the swatching step and see how it all turns out, provided you are willing to live with the consequences – and those consequences could very well reveal themselves in the form of a sweater that does not fit you the way you intended. However, the more I knit (and design), the more I am personally in favour of swatching. You get a lot of information out of those little squares, and if you keep them around after you finish the project, you can still have access to that information later. I have started tagging my swatches with the needle size I used to work it up, and that helps me out if I want to use that same yarn again another time. I have now come to look at swatches as end results in themselves. It’s okay if I don’t turn the swatch into something else later on (though you could, if you wanted – patchwork quilts out of many swatches, mini change purses out of single swatches folded over and sewn up along the sides, and so forth), because it has done its job just being a swatch. Swatches will tell you your gauge, give you a sense of how the yarn feels in your hands, how pleasurable (or not) it is to work with, how nicely (or not) a variegated colour looks in knitted fabric as compared to the skein, how well the yarn drapes (or doesn’t) when worked at that gauge, and can help you to knit both a stockinette swatch and a pattern swatch (like in the Northside pullover swatches, above). If you’ve got a pattern that tells you both a stockinette gauge and a pattern gauge, that’s something worth paying attention to. Swatching does take up yarn, though, so there’s no way around that. Committing to swatching means being willing to buy a little bit of extra yarn for the project, or otherwise be willing to rip out the swatch to put back into the project if you haven’t got the extra to begin with. Or, you could even just buy one ball of yarn up front, swatch it up, and then go back for the project’s worth of yarn (or not) if you’ve decided you like it well enough (or not) to commit to it for a whole sweater. Are you a swatcher? What’s something you’ve learned from a swatch lately? I had a great swatch the other day when I prepared to make men’s socks. Since I’d heard that in-the-round swatches may come out differently than flat swatches, I cylindrically knit up a 2″ length, with moss stitch 1/2″ at either end, resulting in an interesting bracelet! Thanks for such a sensible look at the process of swatching. I love swatching now, sort of like tasting the stew before I put it on the table, we get acquainted, chat a bit, and then proceed. I keep the swatches and they’re especially handy if I want to shop for something to go with the new sweater or whatever, just take the swatch along for the ride! Yes definitely! It’s better to be safe than sorry. But I don’t keep my tension squares – I always end up using that ball too. As well as always swatching, I also recommend washing your swatch as I’ve had gauge change significantly after washing and being laid to dry flat. Im new to the swatching bit but I just don’t like it. LOL. I attempted to knit a gauge swatch on one set of needles then switch to one size smaller needle and then one more smaller size needles (something I saw on a Jimmybeanswool youtube video), but all of my needle changes came out to 18 stitches. Then I started one in the round and I still got 18 stitches. I needed 21 stitches and thought “sure, I can sub in that stash of worsted Caron yarn, why the heck not…I’ll just use smaller needles” SMH!! thanks for your post, I like your style of writing. I’m a bit embarrassed to admit that although I’ve committed myself to swatching for any project that requires shaping, it hasn’t done much good because I seem to have a complete inability to measure swatches or use the measurements properly. I’ve tried washing swatches, avoiding stretching them while I measure, and so on. I can only conclude that when it comes time to write up modifications/schematics, I’m not accounting enough for the fit of the garment. I think I read recently that, just as a looser sweater or heavier yarn can sag under gravity, a sweater with zero ease or less, because of its pulling-inward-ness, is also pulling upward, which means that the row gauge of the swatch may not be the functional row gauge of the sweater. I like snug sweaters, and look terrible in short ones, so I want to avoid this kind of bad fit, and a swatch doesn’t seem to help enough. Now, if someone could come up with guidelines to determine what relationship there is between ease and length, I would probably die of gratitude. I know it very likely varies based on amount of (negative) ease, yarn weight, and stitch gauge, but how much? Any advice? I am definitely a swatcher; especially when I’m knitting a sweater. And I block the swatch to be sure I’m on gauge. For certain shawls and scarfs I’ll knit a swatch when I’m not sure how much yarn I will have or to see the way the pattern looks. I have quite a collection of interesting swatches-maybe I’ll frame them. I was never a swatcher until a hand injury that left me arthritic, now it seems I have to change needles sizes on every pattern I do! The great thing about swatches though is you can make them into baby doll blankets, so I never feel wasteful. Framing them sounds like a great idea too though! OMG, it never occured to me to KEEP the swatch for future reference. Eee Gads, what a lot of work I could have saved myself! Lol! I am unequivocally not a swatcher. I know I should be. I have made entire projects that were the wrong size because i did not swatch. Wasted countless hours and frogged numerous projects but I just seem to have this biologic aversion to swatching. I try, I really do. I buy extra yarn and tell myself I am going to swatch before I start the project, but then I look at the pattern to find out the gauge and see the pictures of what I am about to knit and, well, I just cannot help myself… I jump right in! For instance, today, I just started the Jackson Creek Cardigan. My yarn came yesterday in the mail, I’m using Fibra Natura Oak (60% superwash merino, 20% Linen, 20% silk) and I LOVE this stuff. It has the tiniest of halos, just wonderful…and I told myself last night I would swatch…But sure enough…once again…here I sit with half a cuff on the needles already. I told myself I’ll use the sleeve as a gauge swatch. Once I get the first few inches I can measure the gauge. I tried, I really tried…but this pattern is just so darned beautiful…I couldn’t stop myself! I’m keeping my fingers crossed that the gauge will turn out correct once I have enough of the sleeve knitted to check it. Oh, I HATE swatching. 😛 I almost never do it. It’s the knitter version of Russian Roulette. I don’t with socks, but for things like sweaters, absolutely. And I always used to fret about “wasting” that yarn, but then I remembered that I can totally still rip it out and use it if I need to. This realization has gotten me willing to knit bigger swatches than the dinky things I used to do, too, so I think that’s good. There’s no question, though, that it does delay the fun of starting a project for real. I’ve just gotten into the idea of swatching and it’s not as bad as I remember from about seven years ago. It’s been fun to play with the yarn before having to commit to anything. I still hate swatching, but it is a necessary evil if you want your sweaters to fit. Even more so if you’re writing your own pattern. I find that I enjoy swatching most of the time. I don’t do it for all my projects, but I improvise enough designs that it is often necessary so I know how many sts to cast on. It is also an opportunity for me to ‘start’ my project before I have the time or energy to look at the pattern closely or do my figuring – a head start, if you will. I usually manage to pick the right needle size the first time, so for me a swatch is more for the calculations I need to do. Great post! I was just logging on to do a very similar post but you said it all. Swatching is your friend. Learn to love it and you can learn a lot about how your FO will turn out. 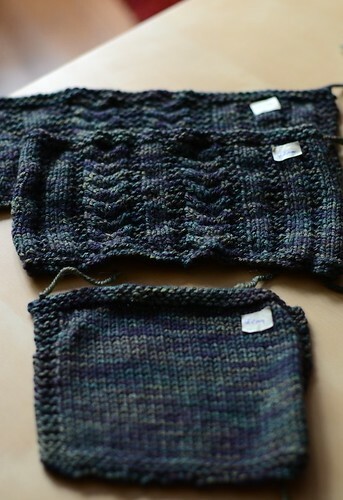 My first ever comment…..I have been knitting for over 50 years and have never swatched. I’ve never seemed to have a problem with garments fitting properly but in recent years, with the aid of blogs like yours and other tv and internet articles I have learned how much I never knew about knitting. I plan to do a swatch to see if it has any impact on my end results. Thanks for all the interesting musings. I started knitting many years ago and then got away from it for a long while until I started knitting socks last Fall. I never did swatches and did end up with a few things that just didn’t fit. When I started doing socks I also started knitting swatches and so far all the socks I have made for my grandkids have fit perfectly. I do sometimes have a problem counting the exact number of stitches. I keep all the gauge and yarn info in a little book so I only knit a swatch if I change the needle size or type of yarn. I wish I had knit these little bits years ago. It makes all the difference in the finished product. This is a fantastic blog post. I like getting another’s perspective on the subject of swatching. Oh, and don’t forget to scroll down and read all the comments. I got a few chuckles, but also some other great insights as well! I am definitely a swatcher. The more I learn about designing the more I am pro swatching. Although for personal projects I tend to only swatch for sweaters. Shawls will pretty much always fit, socks are pretty obvious very quickly if it’s not going to work out. I do tend to swatch for hats because they can be tricky sometimes. I never swatch unless I am knitting a sweater and then I start with the sleeves and use the sleeve as a swatch. I occasionally have to rip out and adjust needle size but it feels like I am accomplising something at the same time. One thing you didn’t mention is the importance of wet blocking the swatch. I have learned, through bitter experience, that that is a vital step, especially where superwash yarns are concerned. I always soak my swatch in a bowl of warm water, often still attached to its ball (not in the wetl), and then lay it out to dry. Another thing I do, when possible, is to use pocket linings or the beginnings of sleeves as swatches. I knit a little, wet block the start of my knitting, then carry on if I’m happy. It’s a shortcut that can work for some designs. The more I design, the more I rely on swatching. However, when I’m modifying patterns or creating my own, swatching is a must. I seem to have a similar problem as another commenter, though. My swatches never seem to help, possibly because I don’t take the time to make a full swatch. I am definitely a “swatcher”. I don’t knit as much as you do, and I don’t want to risk that basket full of beautiful yarn(not to say my time) because the little amount of time it takes to make a swatch. I actually like to look back at those swatches as projects completed , or I’m glad I didn’t waste my yarn and time on that. You mentioned that you might need extra yarn for your swatch but I was told once that designers/pattern writers allow for the swatch amount when they give the yarn requirements. This was in the UK so I don’t know if that’s true worldwide but I’ve always believed that to be the case (but I haven’t knitted enough whole garments and done enough swatches to truly test the theory!). I’ve never knit a swatch in my life and never had any problems, but I thought I might start just as a nice reminder of all the things I knit, even if the end product is given away. Love your commentary on swatching… It’s dreadful for me but a necessary thing if you want some knits to fit just right! Your swatches look great by the way! I spent years avoiding swatching, because it delayed the instant gratification of casting on for a project. As I’ve become a committed sweater knitter, I have accepted and embraced swatching as critical to getting the finished result I desire. Because nothing is worse than spending a month or so knitting up $150 in yarn for a beautiful sweater that doesn’t actually fit. It depends on the project as to wether I will swatch or not. As I am primarily a sock knitter, and have knitted lots of socks, I have a general idea of what a certain needle size and yarn will give me. Some times I do, and some times I will just use the first couple inches of the sock as a gage swatch. I have learned that even thought I may use the same needles and yarn a number of times, that does not guarantee that I will always get the same gage. I knit a pair of socks one year, and a year later knit the same socks with the same needle size and came out with a completely different gage. My knitting had loosened up quite a bit in a year. I find that factors in life, like how stressful, or busy life is or isn’t can definitely affect my knitting. Great blog post on knitting. I know if I ever knit a sweater, I will definitely knit a swatch. As much as I just want to get going, I would hate to have to rip a lot out later. I’m kind of hit and miss with swatching. I have been known to start with a sleeve (especially a stockingnette sleeve like your Dundurn) on the grounds that it counts as a swatch and I’m more prepared to rip it out if the gauge is off. I think the things a swatch can tell you are also the things that put me off swatching. If I LOVE this yarn and have decided I love this pattern I really don’t want to know that they aren’t going to work. This sounds bizarre because rationally, it would be better to know after knitting a 6″ square than a whole sweater. I’m not always rational. I do often swatch stash yarn though with the goal of figuring out what gauge gives me a fabric I like in that yarn. I then use that information to search for a suitable pattern. For some reason swatching BEFORE I’ve picked a pattern is much less stressful for me. And the advanced pattern search on Ravelry means I’m likely to find something I like that works. Which reveals another issue: I don’t like the idea that I have to hit a very specific gauge. And sometimes when I swatch, if I’m close enough I’ll fudge something like the size I knit in the hopes that that will work out and allow me to knit this sweater with this yarn. I was pretty big on NOT swatching but, over the years I have knit I have seen its benefits. I “almost” enjoy it now but, I am far from saying that its my favourite part of my knitting. One thing that helped me get into the habit of swatching was knitting my way through a stitchonary. Not only am I learning alot of cool techniques but, it got me use to knitting just a tiny bit to see how a yarn and/or pattern will turn out. I am sewing every swatch into a massive blanket so, in the end I’ll have a pretty big reminder to swatch and I’ll have a pretty cool blanket to snuggle up in! How do you store your swatches? Are they all just thrown in a box somewhere? That’s what I struggle with, little bits of knitting floating around all over the place! 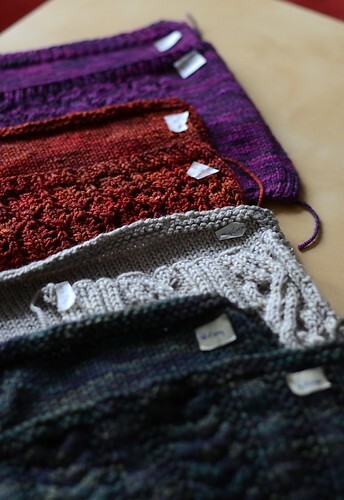 I swatch all the time because I knit VERY loosely. I often have to go down 2mm in needle size and end up knitting on what look like toothpicks! however, I’m a really relaxed knitter! I’ve given up on knitting anything fitted and have taken to creating garments out of rectangles and squares…a cardigan, a sleeveless slip over sweater, and am currently working on switching to make a waistcoat whose back is stockinet re stitch and the two front panels in a lace pattern…two different swatches! You are such a great teacher! I need help with not knitting, but my WordPress account! Any suggestions? Great post. I mostly err on the side of swatching. I’ve even taken to wet-blocking some swatches lately for sweaters. For socks I don’t bother because I usually go toe-up and am familiar with a variety of sock yarns and how they knit up on different needles. I would swatch for a shawl if I felt I might run out of yarn. For baby sweaters, I just check after a couple of inches and if I have to rip, so be it. For adult-sized sweaters, you’d better believe I’m swatching. That’s waaaaaaaaay too much time invested to cast on and hope it comes out correctly. I love to swatch because then I get to test things like the button band, how many stitches to pick up for the placket, the cast off and other finishing elements. I am also in the ‘hate swatching’ camp. I’m the slowest knitter ever, so taking a week to knit a swatch before I can even start a project is daunting. However, I don’t want to knit a sweater that can fit a whale either. The worst part, and the one I can’t bring myself to do most of the time, is wash it to see what happens. This is probably why I knit scarves and shawls almost exclusively. What are those paper bits on your swatches? Are they notes? I swatch with every yarn for to decide which stitch and/ or pattern or technique I’m going to use, what it looks and feel like. Of course to messure it is very helpful orientation, although I rarely follow a pattern, it helps me to create the form of the piece I’m working on. I am not good at making swatches but I have to agree with everything you say; it is basically best practice. I think that possibly the ‘problem’ with knitting is that we can create something satisfactory if we pick up needles and yarn but to make something really good, it is necessary to follow a process properly, I feel.